The Squire was reviewed on Thursday 22nd December 2011 13:00 by Richard. Something about the summertime in Perth makes me want to drink beer and lots of it, and The Generous Squire is a great spot for an afternoon beer or two. I've been to the Squire three or four times this year but every time was a Friday evening after work, and it's hard to do a fair review on any CBD bar after 4pm on a Friday. We booked a table for 20 people as it was a colleagues leaving lunch. Normally with such a big group of people you'd expect more than a few orders to be stuffed up or at least longer than average waiting times, but the meals came quickly and only one incorrect dish came out. A friend of mine ordered the fish and chips and instead was given the fish of the day (seared salmon). Due to the lunch hour rush being in full swing the manager came over and explained it may be another 30 - 40 minutes for the correct dish to be bought out. He also gave the option of accepting the fish of the day dish and in exchange for the inconvenience he'd bring out some free drinks. It turned out that the salmon was delicious and the manger bought out 3 free beers. The service was great and the manager handled the minor stuff up really well. Turns out that the fish of the day was also quite a bit more expensive than the fish and chips, so that coupled with the 3 free beers was an absolute win. The service was great and the staff were polite and cheerful. I ordered the steak sandwich which was great. The steak was cooked really well and wasn't too fatty or chewy. The 'home style' tomato relish was delicious and packed full of flavour. The only thing I could fault them on was the servings were crazy big. I couldn't finish all my chips and still felt so full. Could be worth considering cutting down the serving sizes and bumping the prices down a bit. Not that the prices were high at all, with most mains coming in at under $30 The Squire is really good value. 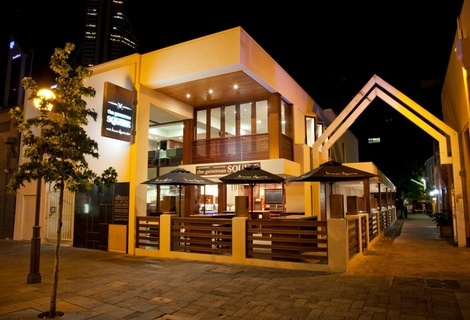 There is a standard selection of wines and spirits on offer and the beers are all James Squire. Beer is a little on the pricey side but the quality is really good so you don't mind paying a bit extra. The building is modern and the furnishings and decor suit the place really well. They focus heavily on the story of James Squire and snippets if his tale can be found throughout the menus, posters on the walls and even embedded into the tiling in the toilets, which I think is great and really gives the place character. The crowd consists of mainly city workers and is quite a contrast to the crowd at the Irish pub (Durty Nellys) next door, which is mainly tradies and is a sea of high viz vests. I would highly recommend The Squire to anyone looking for a beer and/or a pub meal in the city. 4/10Carnegies in Perth, WA (112m away)Cheap drinks and open late - not great for food.